Since before I can remember I was catching snakes, lizards, turtles, and frogs. For some reason they always fascinated me and they still do! 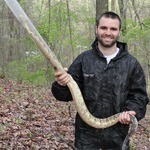 I still go out and actively search for reptiles and amphibians and plan to work with them for my career. My other interests include nature photography, gardening, carpentry, drawing, and enjoying the outdoors. My scientific interests broadly include animal life history, field ecology, and conservation. Got some goldfish for the snakes! The snakes were hungry! Good luck! Let me know when you go out with the dogs. I never got to go when I was at Purdue and I'd love to help out. Not sure yet. I'll let you know. So we went out at night and walked around the ponds at a fish farm and when we saw one we would grab it by hand or with snake tongs. Actually was a lot easier than I expected. Also, might be able to go out in the morning and catch them sunning.